The Earth has a roughly 12 percent chance of experiencing an enormous megaflare erupting from the sun in the next decade. This event could potentially cause trillions of dollars' worth of damage and take up to a decade to recover from. "Even if it's off by a factor of two, that's a much larger number than I thought," he said. Earth's sun goes through an 11-year cycle of increased and decreased activity. During solar maximum, it's dotted with many sunspots and enormous magnetic whirlwinds erupt from its surface. Occasionally, these flares burst outward from the sun, spewing a mass of charged particles out into space. The biggest solar event ever seen was the Carrington Event, which occurred on Sept. 1, 1859. 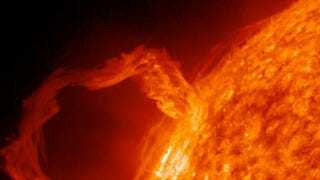 That morning, astronomer Richard Carrington watched an enormous solar flare erupt from the sun's surface, emitting a particle stream at the Earth traveling more than 4 million miles per hour. When they hit the Earth's atmosphere, those particles generated the intense ghostly ribbons of light known as auroras. Though typically relegated to the most northerly and southerly parts of the planet, the atmospheric phenomenon reached as far as Cuba, Hawaii, and northern Chile. People in New York City gathered on sidewalks and rooftops to watch "the heavens … arrayed in a drapery more gorgeous than they have been for years," as The New York Times described it. Auroras may be beautiful, but the charged particles can wreak havoc on electrical systems. At the time of the Carrington Event, telegraph stations caught on fire, their networks experienced major outages and magnetic observatories recorded disturbances in the Earth's field that were literally off the scale. In today's electrically dependent modern world, a similar scale solar storm could have catastrophic consequences. Auroras damage electrical power grids and may contribute to the erosion of oil and gas pipelines. They can disrupt GPS satellites and disturb or even completely black out radio communication on Earth. During a geomagnetic storm in 1989, for instance, Canada's Hydro-Quebec power grid collapsed within 90 seconds, leaving millions without power for up to nine hours. "A longer-term outage would likely include, for example, disruption of the transportation, communication, banking, and finance systems, and government services; the breakdown of the distribution of potable water owing to pump failure; and the loss of perishable foods and medications because of lack of refrigeration," the NRC report said. For instance, companies may store power in areas where little damage is expected or bring on additional lines to help with power overloads. This is assuming, of course, that they are given enough warning as to the time and location of a solar storm's impact on the Earth. Satellites relatively close to Earth are required to measure the exact strength and orientation of a storm. "It's like being able to see a cyclone coming but not knowing the wind speed until it hits your boat 50 miles off the coast," Rutledge said.